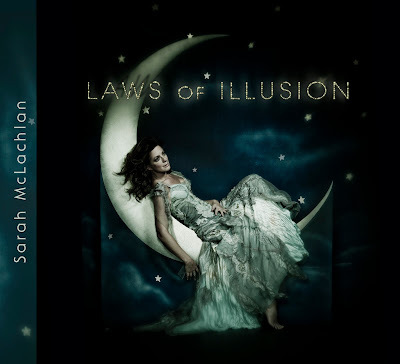 The album artwork for Sarah McLachlan's new album Laws Of Illusion was unveiled today and...wow. Sarah looks ABSOLUTELY stunning. Laws Of Illusion will be McLachlan's first album of new material in 7 years, released on June 15th via Arista Records. A ways back I posted about the album's lead single, "Loving You Is Easy" (which is available to download on iTunes starting today!). Now, the single is the #1 most added song at the AAA radio format! Pretty impressive Ms. McLachlan! And the good news keeps coming! The album is released just 2 weeks before the re-launch of McLachlan's pride and joy, Lilith Fair. Fans who pre-order the new album will be offered the opportunity to purchase advance tickets to Lilith 2010 before they go on sale to the general public. What's more, fans will get a free download of Sarah's new song "One Dream." That sounds like a sweet incentive to me.